Does Wardwell just periodically prank all of Greendale for fun? Satan seems to have a very hands-off management style with her, so possibly he’s not really monitoring the hijinks that she gets up to. She almost murdered an entire high school in the prior episode, so presumably she has pretty free rein to keep herself entertained. It’s a little hard to tell exactly what she’s getting out of this particular bout of spying, but it does give the show the chance to explore the not-so-secret desires of its core characters. Sabrina, Ambrose, and Zelda want to know if their relationships will work out, Roz and Theo are considering health shortcuts, and Harvey needs to decide whether to visit Rhode Island, where, as we all know, a portal to actual Hell exists. Never has anyone spoken the words “Rhode Island” with the same reverence as people on this show do. 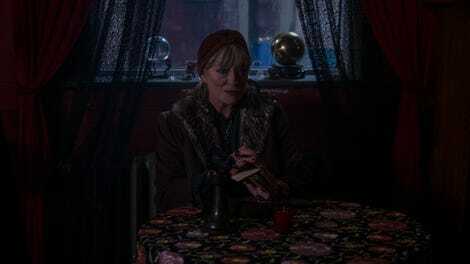 "Doctor Cerberus's House of Horrors"
The big reveal that Wardwell is behind all the tarot readings makes it much harder to determine how seriously to take her insights. Are these visions accurate, and Wardwell is using them to spy, or is she bringing the visions on? Can Sabrina truly trust Nick, or is that just what Wardwell wants her to do? The vision she has of his magic show is not too reassuring—he cuts a woman in half, banishes another to the Other Realm, and sends the third into the vacuum of space. Despite Wardwell/McGarvey’s attempts to get her to trust him, Sabrina clearly has a lot of concerns about her new boyfriend. In her vision, his whole magic show is designed around harming women, all put on for an audience of women. She seems to fear what he thinks about women, and what women think of him. And given the Church of Satan’s attitudes around gender relations, it makes sense that she’d have some concerns about dating someone raised very much by its rules. The show wrote off Father Blackwood’s other baby so quickly, it was easy to think that might be the last we’d hear of her. But no, that baby is very much still important, a specter haunting Zelda as she pursues her relationship with him. And now Wardwell knows about the baby, which might be the biggest piece of blackmail she earns from all of this, and the biggest advantage she’s had yet over Sabrina herself. Roz and Theo’s visions are thematically somewhat similar, despite the difference in what they’re trying to achieve. If they cut corners to achieve the physical changes they’re both seeking, are they going to like the people they become? Both of these stories resolve in somewhat unexpected ways, given what we know about Wardwell. She gives Theo surprisingly sound advice about not stealing or meddling with magic he doesn’t understand, even if he’s feeling desperate. There’s really no upside for her in helping him with this issue. She’s just being a good responsible adult. And if anything, she’s helping Roz steer her father onto a more noble path. Is Wardwell secretly a very good guidance counselor? That said…there’s a lot that’s concerning about the way Theo’s vision unfolds. The person giving him advice about how to handle his situation is Dorothea, his ancestor, who thus far is the entity who seems to most understand the truest version of him, which makes it all the more upsetting that she tells him to lie and steal. It’s an unsavory connection between a queer elder and a sinister influence. The focus on the physical aspects of his transition also feels really unnecessary, and the moralistic underpinning to his decision-making here is mostly absent in the other visions. Everyone suffers in their visions, but Zelda facing consequences for stealing Blackwood’s baby is not exactly the same situation as a trans person trying to feel happy in his own body. The uncomfortable suggestion about his willingness to undergo an amputation to have the body he wants reads as a very literal-minded take on what transition means. Covering this as a cisgender recapper means that the handling of this plotline is going to hit me in a very different way than it would someone who is actually going through transition, and I want to be respectful of the show’s efforts to be creative in the way they portray what’s going on with Theo. 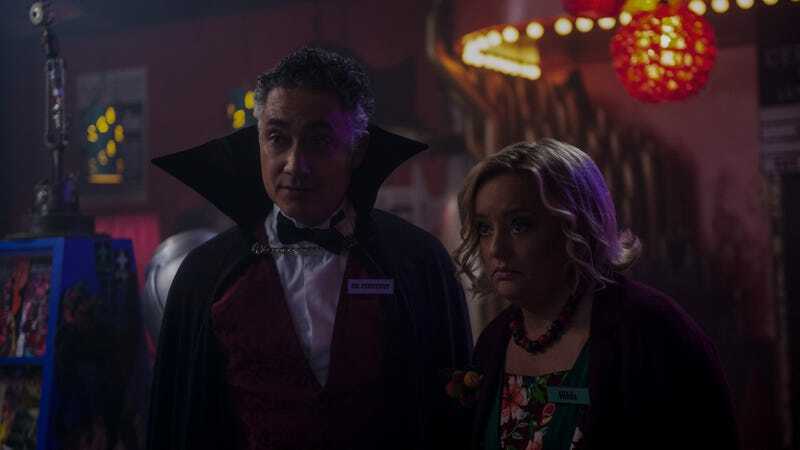 But CAOS has in the past occasionally shown an insensitivity around its storytelling (like the child-murdering demon celebrating the “Festival of Lights” in the Christmas special), and I’m not sure I can give them the benefit of the doubt here. I’ll also admit to being extra cautious because I’m keenly aware of GLAAD’s guidelines for journalists, which indicate that the media should avoid “overemphasizing the role of surgeries in the transition process,” which is the opposite of what happened here, even if it was symbolic. It’s possible I’m overreacting here, and I’m very interested to read other takes on this. But to me this was a very clumsy handling of a very sensitive subject. The most surprising vision might come courtesy of Ambrose, whose life has changed almost as drastically as Sabrina’s has in recent months. After decades of imprisonment, he finally has access to all the things he once did. What’s he going to do with them? His vision suggests that, much like Zelda, he may have a lot more interest in power and its trappings than his former bathrobe-wearing ways may have suggested. The Spellmans have been out of power for a long time, and the prospect of some of that glitz and glamour being restored seems to be affecting all of them, except for Hilda, who just wants to hang out with her new incubus boyfriend. Regardless, the person Wardwell seems most intrigued by is Harvey, who has a vision that the actual apocalypse might be coming, and that he may have some role if it does. And if that should come to pass, Wardwell doesn’t seem particularly concerned about protecting Satan’s interests in it. Does every genre show just use the name Arkham freely? The scene with Harvey’s roommate was generally pretty upsetting (did we really need the prolonged shot of him hanging up there?) but there was something a little comical about all of the demons just showing up to get their portraits painted. Everyone has vanity. Come on, no Hilda vision?